Home » Photography Travel Blog » Travel Photo of the Day: Bus Boat in Budapest! 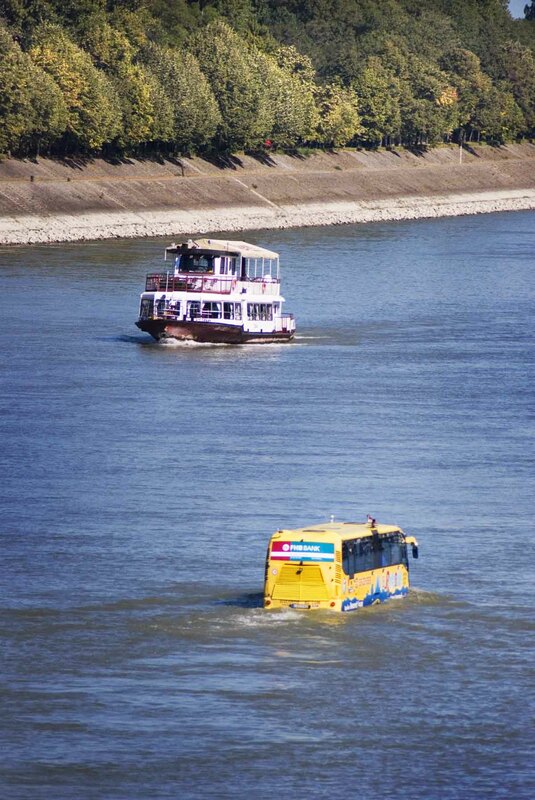 No, you are not seeing things: This is in fact a bus cruising through the Danube river in Budapest! We just returned from our travel clubs trip throughout Eastern Europe and the first thing we saw upon arriving in Budapest was this bright yellow bus floating down the Danube River. Similar to the popular “Duck Tours” found across the most popular US cities, Budapest has come up with the newest way to experience their brilliant city! Hop on the bus in dry land for a city tour throughout the streets of Budapest before driving straight into the Danube River for a bus cruise of the stunning sites on each side of the city. You can get great shots of Gellert Hill, Fisherman’s Bastion, & the Citadel on the Buda side and the magnificent Parliament building on the Pest side of the river. And all this without having to hop off the bus! The photo does look a bit surreal! I think this is a great way to see a city. When I was in Singapore I took the Bus Tour that went into the water and on land. The vehicles were older decommissioned vehicles left over from the US army during the Vietnam war. Wow those vehicles must have been pretty cool looking! Do you have any shots of them on your site? haha yeah you should have seen it cruising down the river! I’ve seen plenty of duck tours around the world, but this is the first one with something that looks like a coach rather than an old army vehicle painted yellow!